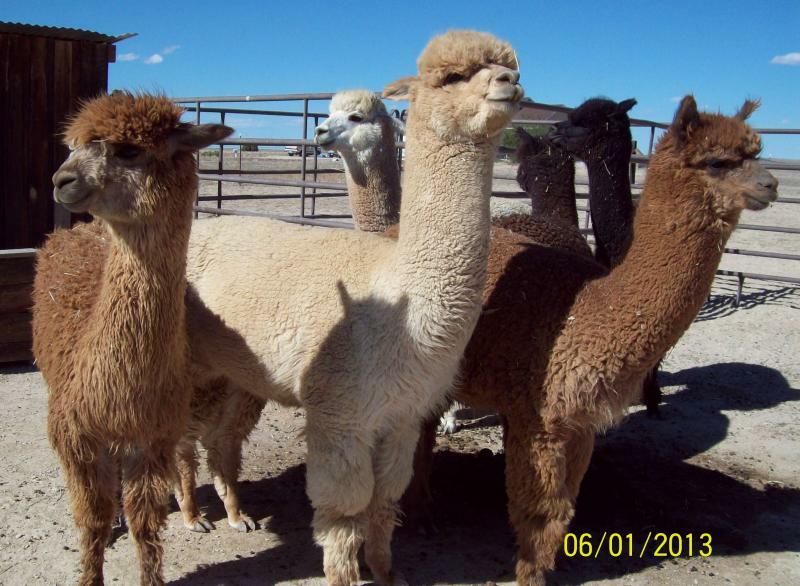 The members of the Alpaca Fleece Production Team are pictured left to right. All of the Team members are well-bred, gelded males who enjoy a close-knit herd. Muffin - is our resident hippie. He is gentle and easy-going and very close to brother Richard. Muffin loves his summer baths with the hose and muscles his way to the front for the first squirt. Muffin is our only Suri and is Medium Fawn in color. Arcturus (looking left) - is the Leader of the Pack. He wants to be your friend but it's lonely at the top. He keeps his brothers in line with occasional nips and wrestling that sometimes land him in time-out. Arcturus is a Huacaya, Light Fawn in color and has won ribbons in show. Hamal - is our Cookie Monster. He loves his groceries! Hamal is quiet and aloof but doesn't take any guff from brother Arcturus. Hamal is a Huacaya, Medium Fawn in color and has won ribbons in show. Pogo (looking back) - although the same age as Tennyson, is the baby of the family. He still has that wide-eyed look of a toddler with eyes fringed by non-stop eyelashes. Pogo is frequently the cause of Arcturus' outbursts but somehow doesn't end up in time-out. Pogo is a Huacaya and Bay/Black in color. Richard - is our social butterfly and most friendly. He is also the most curious of the boys and has been voted Most Likely to Spit. Richard gets very excited on Crumbles Day and performs his Crumbles Day Dance when he hears us shake up the mix. 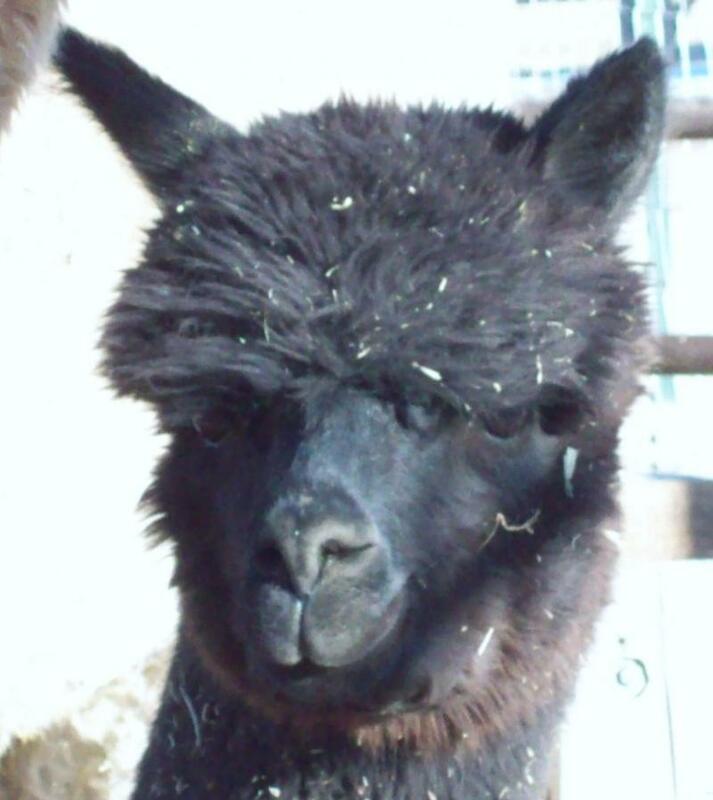 Richard is a Huacaya and Black/Brown in color. Tennyson- is friendly and curious but cautious. He enjoys daily strolls in the pasture whether his brothers accompany him or not. He has an adorable, expressive face that is entertaining and makes him especially photogenic. Tennyson is a Huacaya and Light Brown in color. Cocoa - carries himself like a prince. He ran interference for little brother Pepe when they first arrived at High Plains. Cocoa acts offended when touched but it's funny how he's always nearby. Cocoa is a Huacaya and Dark Brown in color. Pepe - may always be our baby. He is mellow and easy to handle except when crumbles are at hand; then, he's as excited and protective of his dish as the big boys. Pepe is a Huacaya and White in color. Our prime fleece is soft and fine while the subse-quent cuts are repurposed for other uses and crafts. True to our hands-on methods, our fleece is pro-cessed by hand here at High Plains and is never run through a machine or sent away for commercial processing. We also compost alpaca manure for use in fertilizing your plants, landscaping, and garden. All quantities can be picked up at High Plains. See details on the Trading Post Page. Do you have questions? Please contact us anytime! We look forward to hearing from you. See the ﻿Visit High Plains Page to arrange a personal visit with these wonderful, unique animals. 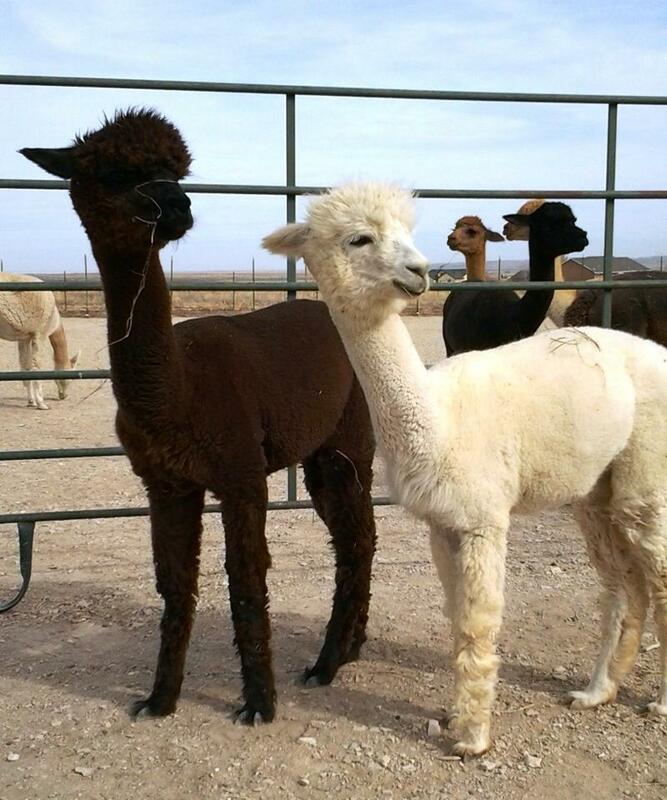 Our alpacas produce fleece that is grown, processed, and marketed right here at High Plains.